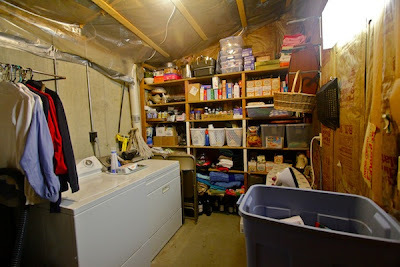 My laundry room redo is a big enough project that I can't just do a before and after photo shoot and share in a summation blog post. No, this project has the potential of being an epic adventure with me learning important stuff along the way. Yesterday I shared with you my free-form shaped room and the initial idea. Today some "as is" photos. You'll understand how important the upgrade is to our home. Scary view right? I had to use a wide angle lens because there is only so much space in this eyesore. There is some distortion but you can see the scope of the project. 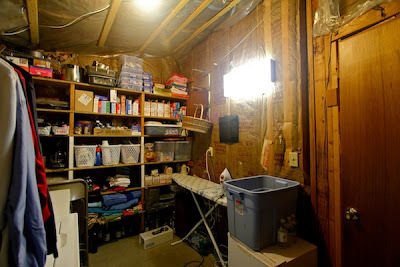 In looking at that back wall you can see the pantry function is important, and you can see that it is relatively organized but certainly not attractive. That indicates that I need closed storage. The things that will be kept here are not pretty. There are several obvious inefficiencies in the current layout of this room. One is this huge wall over the ironing board. 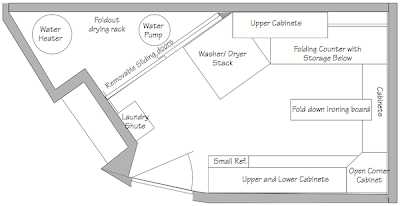 It should be cabinets and will be in the new layout. Just no reason for underusing this valuable space! I don't think I need to go into detail about how bad the lighting is. Upgrades there are essential. This view is looking into the black hole of wasted space. 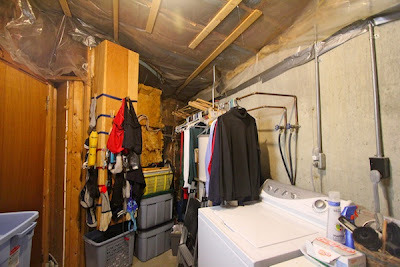 I hope to rearrange the utilities (hot water heater and water pump) plus plumbing to make better use of this corner. This is where I need expert advice. I need to know what is possible. I also want to inquire about a water softener system. We have extremely hard water and are always clogging every thing with iron filament. Now would be a good time to address this. So folks, cheer me on! I've been saving my pennies for years for this upgrade and the time is here! Let the fun begin. Wish I'd found your blog earlier so I could have cheered you on! This looks like it was indeed an adventure, and I so appreciate your posting all the details of it so I could read through them and get inspiration several years later!